Machine embroidery is so versatile it becomes a palette with enormous possibilities when you add simple embellishments. Embellishments add interest by making embroidery three dimensional, introducing textures, and adding sparkle. Hot fix crystals are one way to accentuate embroidery designs. Some designs are digitized specifically for crystals, but most any design can benefit from a few. 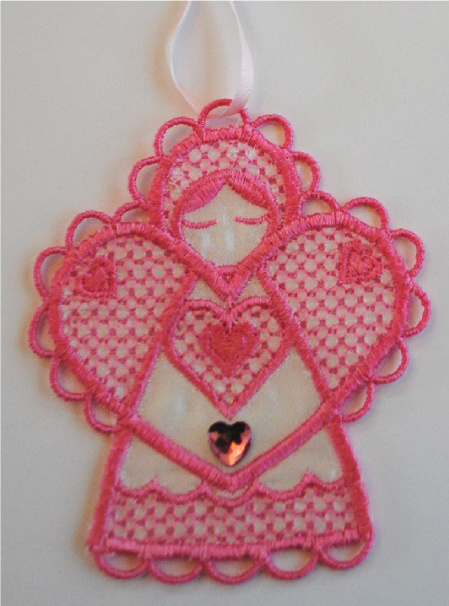 I've also used crystals on freestanding lace snowflakes, to add sparkle when they catch the light, and heart-shaped rhinestones in birthstone colors to customize gift ornaments. One of my dear friends made me this gorgeous purse. The front features hand embroidery, so I am using it to show some ways machine embroidery designs can be embellished. Seed beads are wonderful for small details. They could easily be substituted for the gold flower centers and small purple pods. 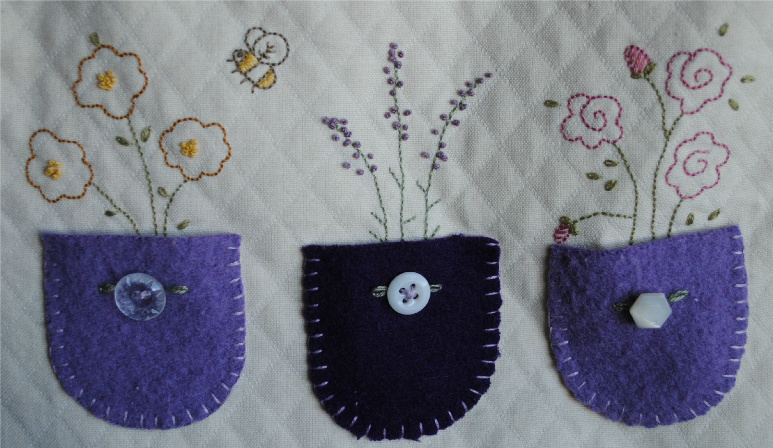 Buttons are another way to accent embroidery. There are so many different types and shapes of buttons, you are sure to find at least one that you can use on your projects. My purse has buttons on it's pockets to simulate tiny flowers. 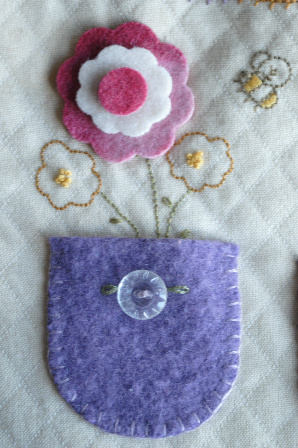 You could also use the button in place of the embroidered flower. Just skip the color stop for the flower petals and hand-stitch a button in its place. To really mix things up, stitch just flower stems and leaves. 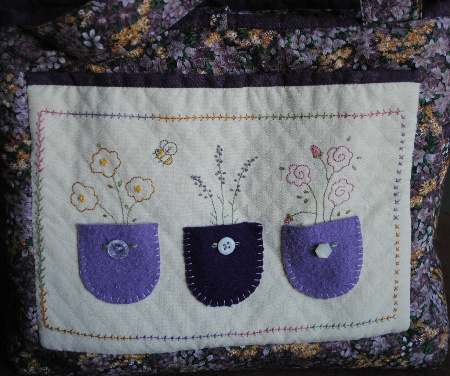 Then add buttons or, in this example, felt flowers. I cut these on my AccuQuilt GO! using the Rose of Sharon #1 die. I layered two felt flowers with a circle in the middle. Substitute a round button for the felt center for even more variety. Layers could be blanket stitched before or after adding them to your base fabric. Outline designs like the flowers on my bag are perfect for a fun technique using Sharpie markers and rubbing alcohol. Check out the tutorial here. If decorating a product that will be laundered, make sure items added are washable, colorfast, properly secured, and shrink resistant. Be very careful when accenting items for small children such as buttons, beads, and crystals could be a choking hazard. Use coordinating thread. Often, I pick one of the more subtle colors as an accent. Metallic threads add sparkle of their own. Have any unique ways you enhance your embroidery designs? I'd love to hear your ideas! 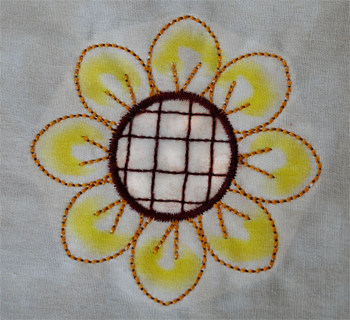 I also love bean stitches and saw your post before making the "painted" sunflower. You are ahead of your time- bean stitch designs are showing up everywhere of late!